When asked, “Are you going Steampunk?” this globe says it all. Inside the miniature world of a swirling, glittering snow globe, tiny workmen on ladders remodel a plain fairy cottage into a steampunk dwelling, adding watch gears, an elaborate rooftop and riveted metal embellishments. Shake the globe and watch the world shimmer with gold microdust, settling slowly as the craftsmen get back to work. Details: Four-inch glass globe encasing a one of a kind mixed media sculpture of clay, wood, leather, vintage jewelry and metal findings. The interior sculpture is just over two inches tall; it appears slightly larger due to magnification of liquid and glass. The round wood base is wrapped in a indented and pressed clay band with added gears and hardware on the touchable exterior. 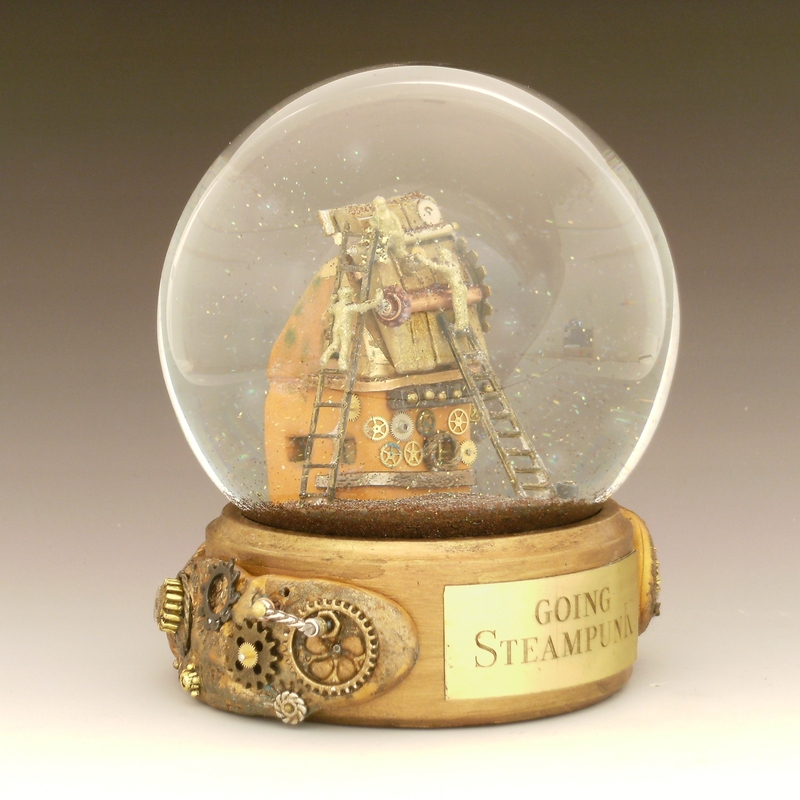 Engraved metal plate states “Going Steampunk” — this snow globe will be auctioned to support arts education programs by the Cherry Creek Arts Festival. A ship in a bottle? 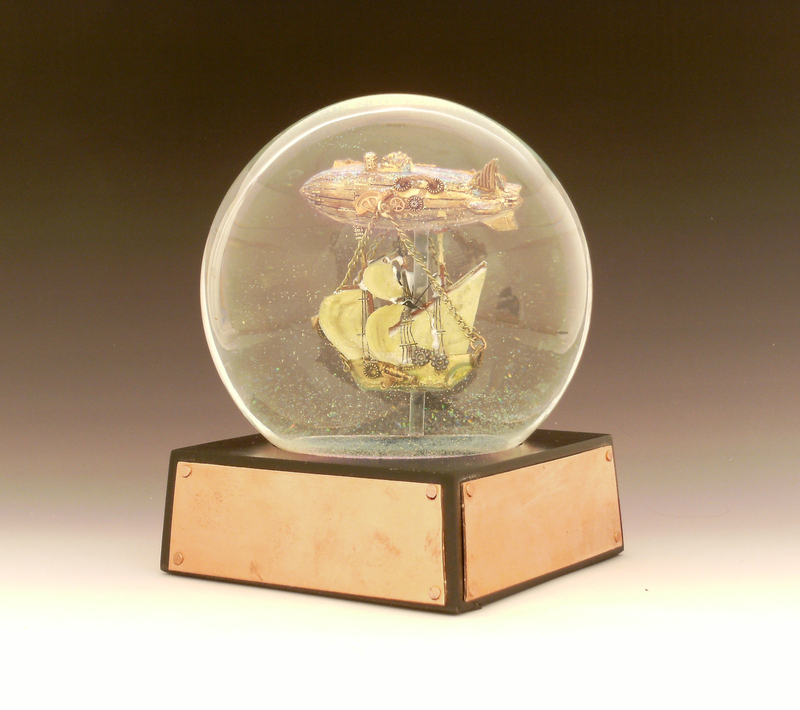 An airship in a snow globe. With glittery, star-sparkled dust carrying it on an adventure, Starship Explorer rides the airwaves. 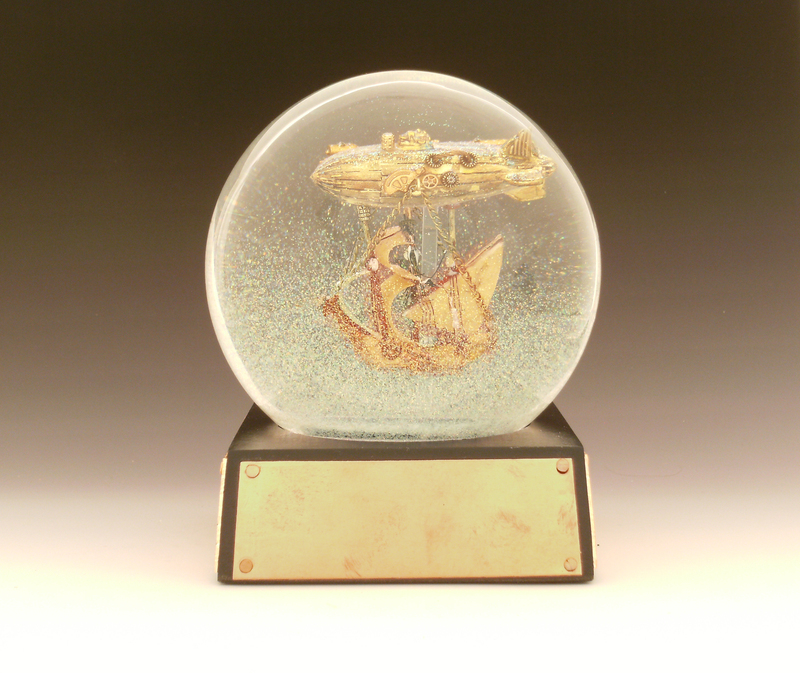 Five inch glass globe containing a tiny steampunk zeppelin and sailing ship below, when shaken, the liquid-filled globe shimmers with gold and iridescent microdust. Custom copper plates riveted into four angled sides of base.